In addition to poring over old photographs of Toronto on a regular basis, I try to get my hands on historic maps of the city as often as I can. As far as general overviews go, it's tough to beat Derek Haye's Historical Atlas of Toronto, a book that I've lauded on more than one occasion. But, it's not without its limitations. As excellent as the selection of maps is, offered in book-format, the collection doesn't allow for the type of close examination that one gets with the real thing or a high resolution digital scan. 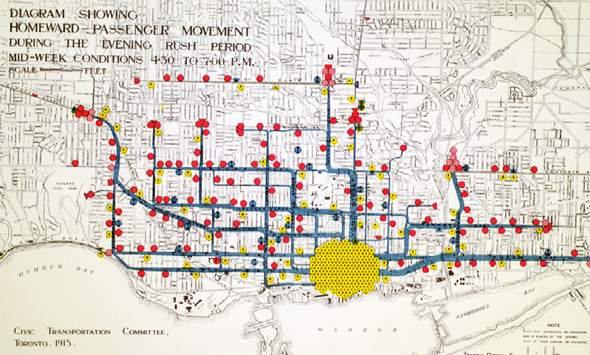 Enter the University of Toronto Maps collection. Although perhaps old news to Toronto-based geographers and historical researchers, the casual fan of Toronto history will be fascinated by U of T's extensive holdings. I've used the collection a couple times in the past in an effort to find specific maps I've seen elsewhere (a notable example of which is the wall-sized archival map at the White Squirrel Coffee Shop), but only recently have I spent extensive time perusing the impressive collection. 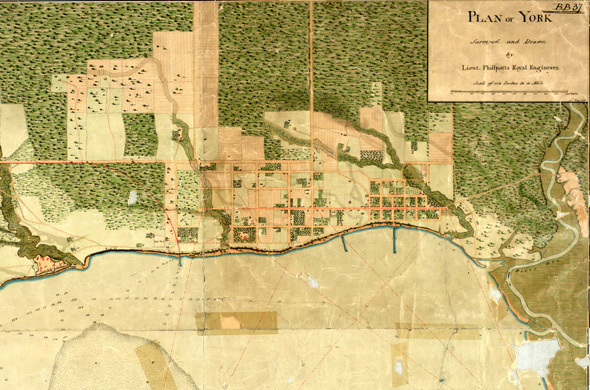 With holdings that date back as earlier as 1788 (at least by my searching), many of these maps are more specific than your garden variety road plan. Here you'll find topographic maps, transit ridership maps, sewer system charts and a whole variety of other cartographic efforts you're unlikely to come across elsewhere. Although the majority of these maps are available for digital download, there are some important exceptions, one of which is Goad's Fire Atlas (only available at the library). But, not to fear, I've already got that one covered. The best way to navigate the database is simply to use "Toronto" as the key term at the main search page. Another option is to visit the Don Valley Historical Mapping Project, which offers a smaller selection of maps of the waterway and the old city (we'll have more on this later). One caveat, however - some of the files on these sites are enormous. So be prepared to wait awhile for them to download (and try to avoid having 50 other tabs open like I do right now!). All images from University of Toronto Libraries (but of course).